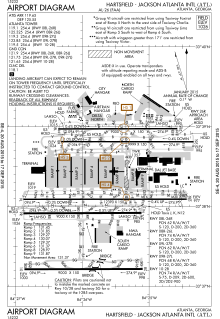 Hartsfield–Jackson Atlanta International Airport (IATA: ATL, ICAO: KATL, FAA LID: ATL), known locally as Atlanta Airport, Hartsfield, an Hartsfield–Jackson, is locatit seven miles (11 km) sooth o the central business destrict o Atlanta, Georgie, Unitit States. It haes been the warld's busiest airport bi passenger traffic syne 1998, an bi nummer o laundins an take-affs syne 2005. Hartsfield–Jackson held its rankin as the warld's busiest airport in 2011, baith in passengers an nummer o flichts, bi accommodatin 92 million passengers (252,000 passengers daily) an 923,991 flichts. 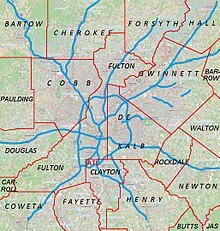 Mony o the nearly ane million flichts are domestic flichts frae within the Unitit States, where Atlanta serves as a major hub for travel throughoot the Sootheastren Unitit States. The airport haes 207 domestic an internaitional gates. Hartsfield–Jackson Internaitional Airport is a focus ceety for Soothwast Airlines an is the primary hub o Delta Air Lines an Delta Connection partner ExpressJet; At nearly 1,000 flichts a day, the Delta hub is the warld's lairgest airline hub. Delta Air Lines flew 59.01% o passengers frae the airport in Februar 2011, AirTran flew 17.76%, an ExpressJet flew 13.86%. The airport haes internaitional service tae North Americae, Sooth Americae, Central Americae, Europe, Asie, an Africae. As an internaitional gatewey tae the Unitit States, Hartsfield–Jackson ranks sevent. ↑ "Operating Statistics". City of Atlanta. January 2017. Retrieved February 16, 2017. ↑ "Atlanta airport still the "busiest"". Hartsfield-Jackson. January 4, 2010. Archived frae the oreeginal (PDF) on January 6, 2007. ↑ 3.0 3.1 "Operating Statistics". Department of Aviation, Hartsfield–Jackson Atlanta International Airport. Retrieved March 23, 2011. ↑ "Atlanta, GA: Hartsfield-Jackson Atlanta International (ATL)". Bureau of Transportation Statistics. February 2011. This page wis last eeditit on 4 Mairch 2018, at 01:44.